Good morning. My name is Adriana Espinoza, and I’m the Director of the New York City Program at the New York League of Conservation Voters (NYLCV). NYLCV represents over 30,000 members in New York City and we are committed to advancing a sustainability agenda that will make our people, our neighborhoods, and our economy healthier and more resilient. I would like to thank Chair Rodriguez for the opportunity to testify before the Committee on Transportation. One of NYLCV’s top priorities is to increase access to sustainable, low-carbon modes of transportation, especially where those alternative modes can reduce reliance on cars or connect New Yorkers in transit deserts to the nearest public transportation hub. We believe e-scooters represents one such opportunity and should be explored. However, embracing a new low-carbon mode of transportation must also come with the recognition that there is a similar mode that has been operating in a legal grey area for years despite being part of the fabric of New York City. Last year New York City’s Department of Transportation (DOT) clarified legal status for pedal-assisted e-bikes but gave no resources to the many delivery workers who rely on e-bikes for their livelihood. Instead, we have seen increased confiscation and fines levied against workers who still use fully motorized e-bikes. NYLCV supports Intro 1265, which would establish a conversion program for low-income New Yorkers to convert their fully motorized e-bikes to pedal assist e-bikes. We believe this is more constructive than the punitive status quo that disproportionately impacts low-income immigrants in this city. Because addressing this issue is a priority for NYLCV, this bill will appear on our City Council Environmental Scorecard. We also support exploring new modes of transportation but want to do so in a way that adopts the best of what other communities have experienced and minimizes negative impacts. That’s why NYLCV believes a pilot program is the right approach to introduce e-scooters in NYC. It is also aligned with OneNYC’s visions of thriving neighborhoods and improved mobility for all New Yorkers. NYLCV believes it is important for DOT to be able to study how e-scooters are adopted and used by New Yorkers, in which types of neighborhoods they make sense, how and where charging is managed, and whether dock-based or dockless models are the best fit. For these reasons, NYLCV supports the passage of Intro 1266 and is including the bill on our upcoming NYC Council Environmental Scorecard. However, instead of focusing only on areas impacted by the reconstruction of the L-train tunnel, all communities lacking easy access to public transportation should be considered. We also recognize Intros 1266 and 1250 must pass as a package for a pilot to commence, so NYLCV offers support for Intro 1250 so long as the legalization of shared e-scooters are subject to rules and regulations promulgated by DOT and only broadly deployed following the successful completion of a pilot program. NYLCV is also a strong supporter of the Mayor’s Vision Zero initiative, and we believe bike lanes are a critical component of its success. We applaud DOT for adding 20 miles of bike lanes in 2018, but more must be done to ensure these lanes remain unobstructed. For that reason, NYLCV supports Intro 1163, which would require holders of construction permits to preserve access to bike lanes. Sudden obstructions of bike lanes, whether from parked cars or construction equipment, are dangerous to cyclists who must move into traffic to avoid the obstruction. With access to alternative modes, safe and well-designed streets, and a connected network on bike lanes, New Yorkers can more easily pursue sustainable modes of transportation and reduce dependency on high-emissions vehicles. 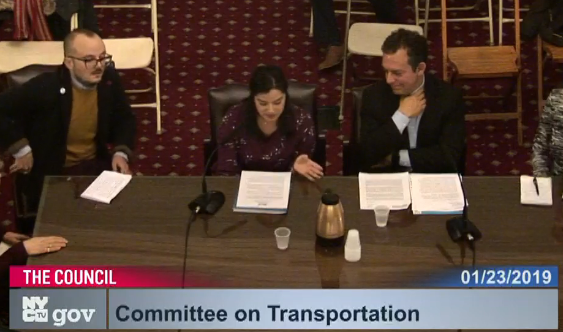 I’d like to thank the Committee on Transportation for your ongoing support for transit issues that concern our members, and I look forward to continuing this work in the future. Thank you for your time.